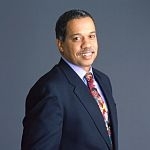 On June 18, 2009, NPR Senior news correspondent Juan Williams delivered the keynote speech to the Vermont Business Rountable as part of their 2009 Summer Celebration. VPR was on hand for his speech, "The Latest from Washington-An Insider’s View." For pictures from Williams’ visit to VPR visit the VPR Blog. Click here to hear his interview with VPR’s Mitch Wertlieb.